The heavily promoted #FryFutbol trend has scored big time globally McDonalds. McDonald’s has kicked-off FIFA World Cup with a first-ever global French-fry packaging redesign and new, augmented reality trick-shot app. While most Americans consider soccer to be barely a sport, the rest of the world eats it up like a cheap cheeseburger. 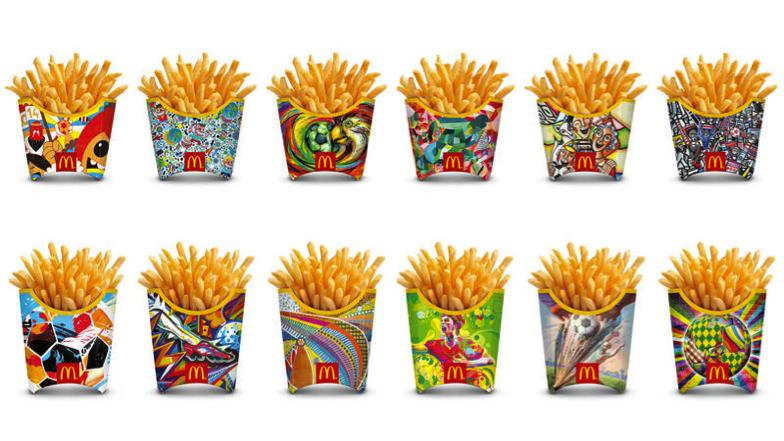 And in anticipation of this years’ event, McDonalds’s had 24 artists from around the world sell their soul, or as McDonald’s put it: “create exceptional interpretations of the glory of the beautiful game” on boxes of fries. The designs look like a surreal, LSD induced soccer fever dream, with a colorful, swirly parrot adorning one of the boxes. The campaign is telling users to download McDonald’s Gol! app, which combines French fries with the iOS and Android camera to create an augmented reality soccer game. But the new boxes aren’t limited to an assault on your eyes. If you snap a photo using something called the GOL! app, a kind of mini soccer game can be played on your phone. Keep in mind that the app is free, but the fries are gonna cost you, and not just monetarily. As a companion to this branding extravaganza, a two-minute video was produced showing all kinds of soccer trick shot magic being performed ostensibly in Brazil. A little boy hits and rings the town’s bell with the ball, while an old man surprises a gaggle of onlookers with his ball balancing skills. McDonald’s is obviously old hat with sponsoring World Cup events. They were a lead sponsor in 2010, so this blitz of promotion comes as no surprise. We don’t even know for sure anymore where the 2022 World Cup will be, but I’m willing to guess that wherever it lands Ronald will have already set up shop.